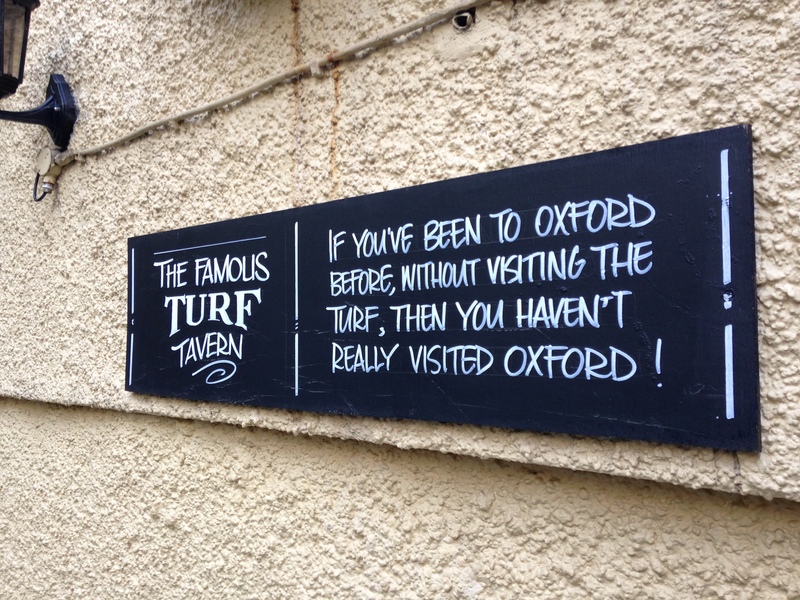 I was commissioned to write this review of The Turf Tavern in central Oxford by Goodman’s as part of a guide to the city. It will be part of a complete guide to Oxford’s attractions, which I will link to when it is complete. 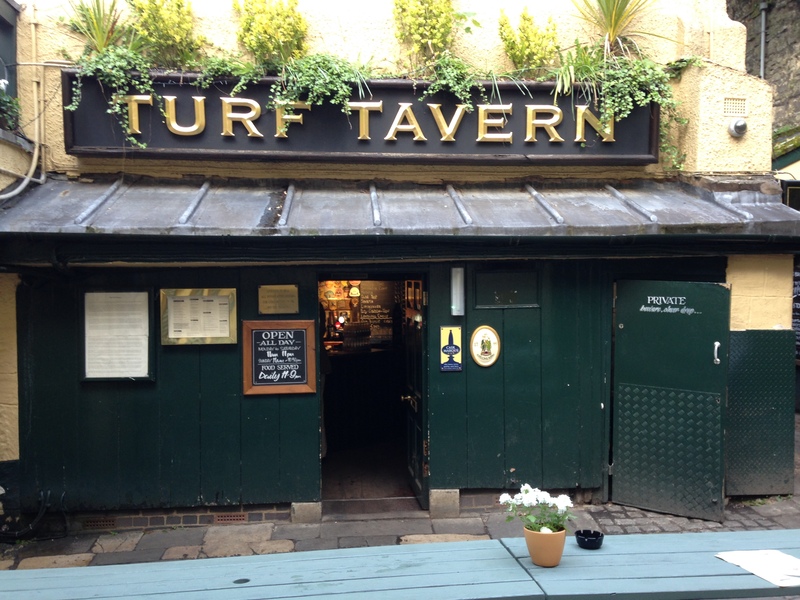 The Turf Tavern is one of Oxford’s oldest pubs and dates back to the 13th century. 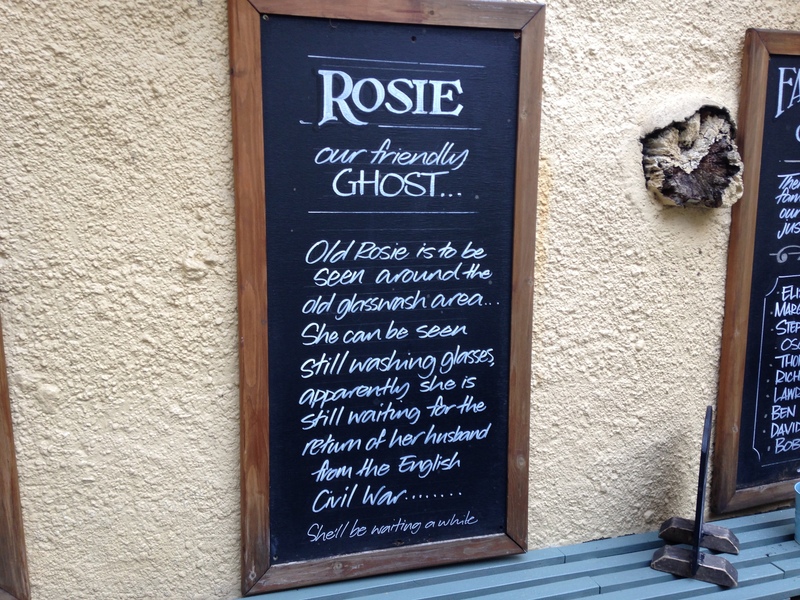 Its history gives it an amazing atmosphere, and in a way it feels like part of the ‘real’, old, Oxford. Centuries of students, dons and visitors have made their way down the little alleys that lead to this iconic place. 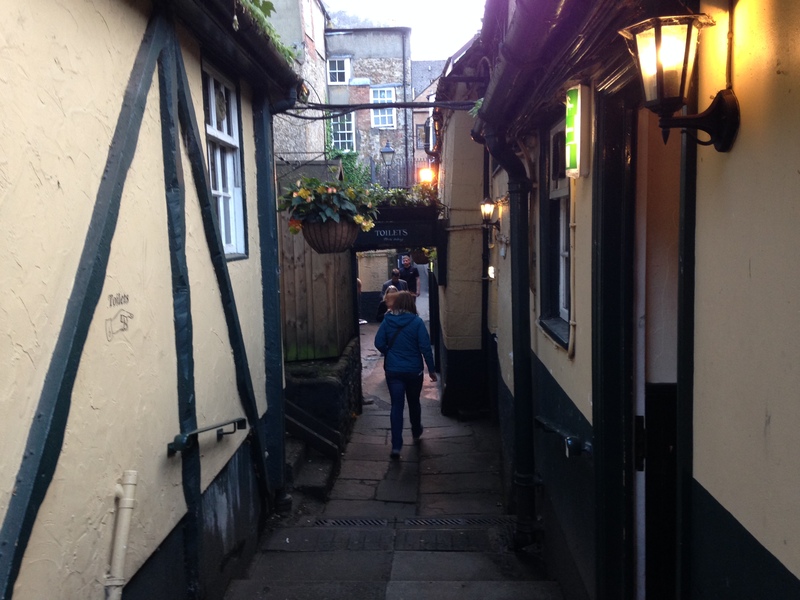 Buildings have grown up around The Turf, and it is only accessible through a series of alleyways leading from Holywell Street and Queen’s Lane, adding an air of mystery as you turn off the main stretch and find your way to this beautiful little pub. I visited with my boyfriend on a Saturday night, which is inevitably busy, but we arrived at about 6.45pm and there were still plenty of places to sit. 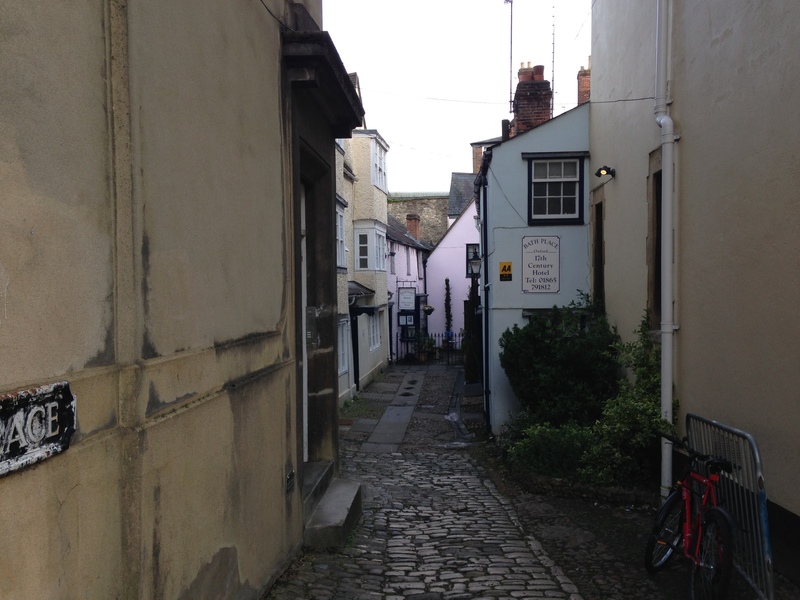 We walked along Broad Street and onto Holywell Street, reaching The Turf through Bath Place. 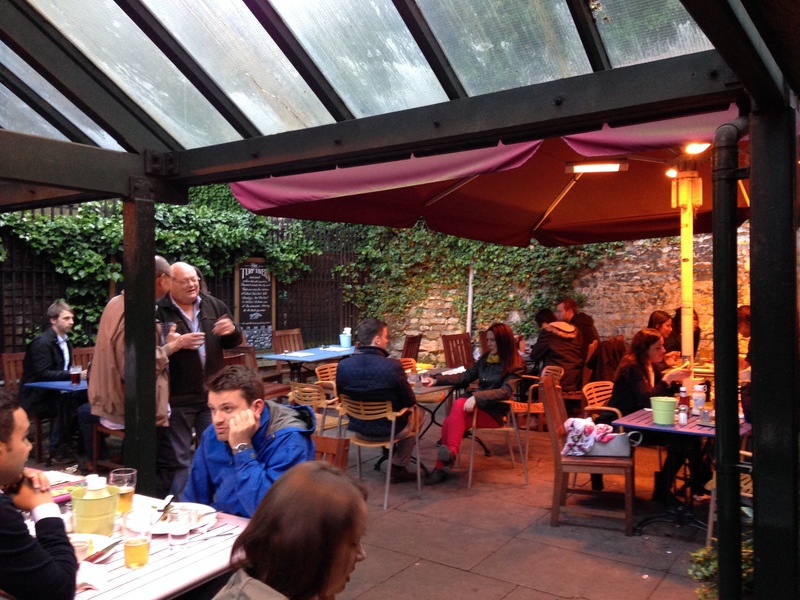 There are three spacious outdoor areas, all of which are roomy but still cosy, and are surrounded by some really lovely little old buildings. There are lots of tables in different sizes, so it’s great for couples as well as big and small groups. 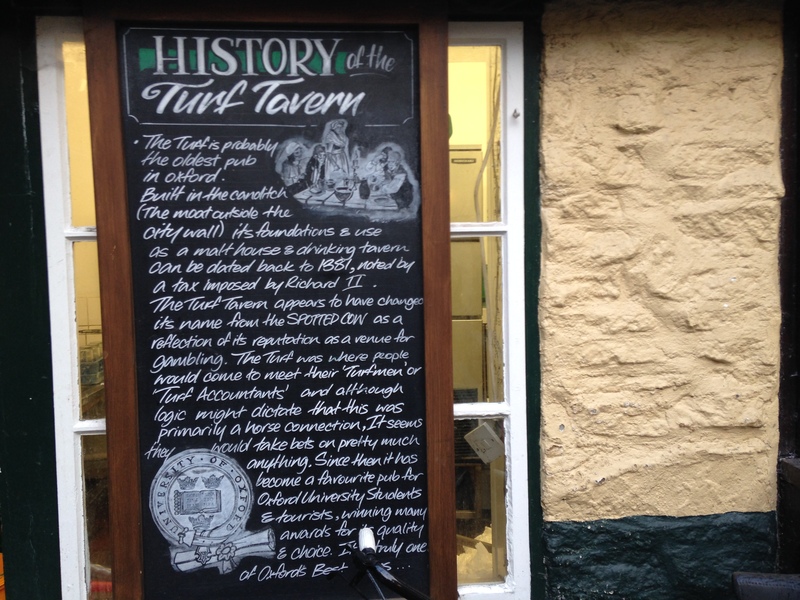 In the space at the ‘front’ of the pub there are several blackboards boasting of The Turf’s history, which is part of the history of Oxford itself. 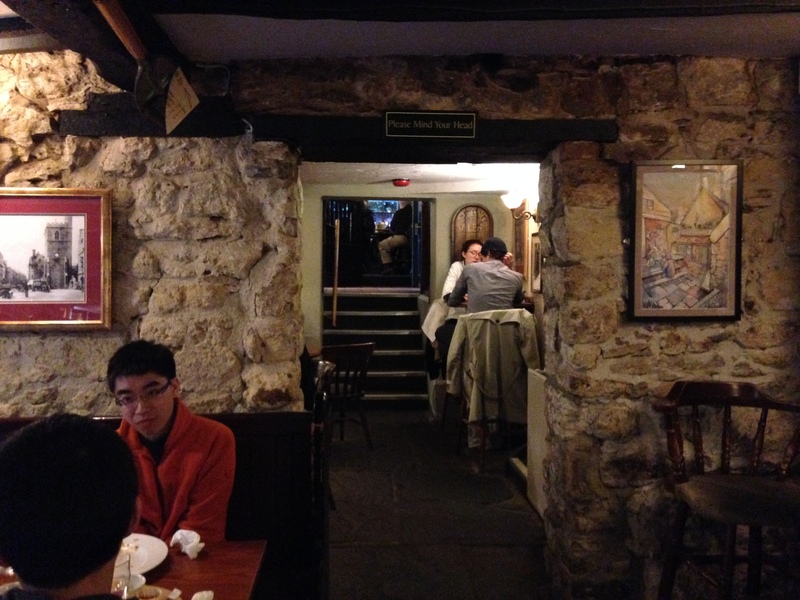 The inside of The Turf is made up of several small rooms, on two levels, all crowded with old wooden tables and wooden ceiling beams, and always full of happy people. 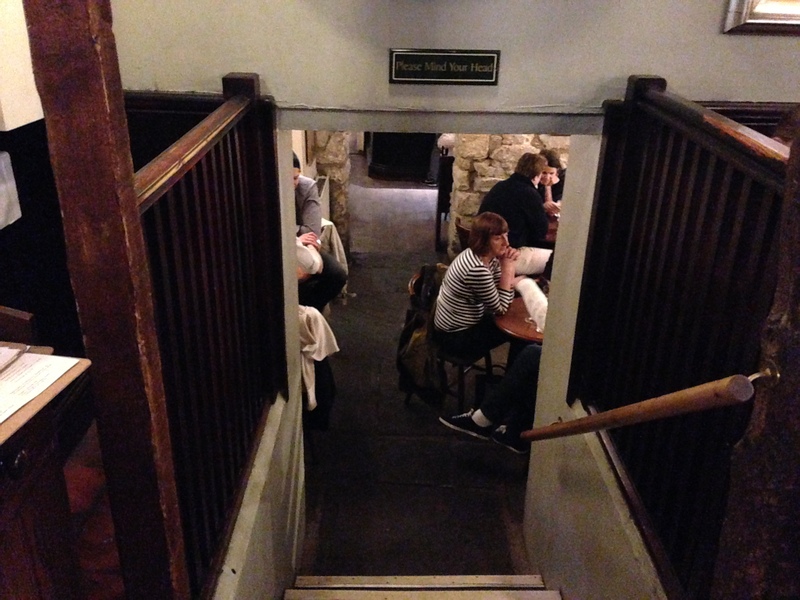 There are three small bars that do tend to get quite busy, so it’s normal to expect a small queue. The staff are very helpful, efficient, and friendly though so they work quickly and are very attentive. 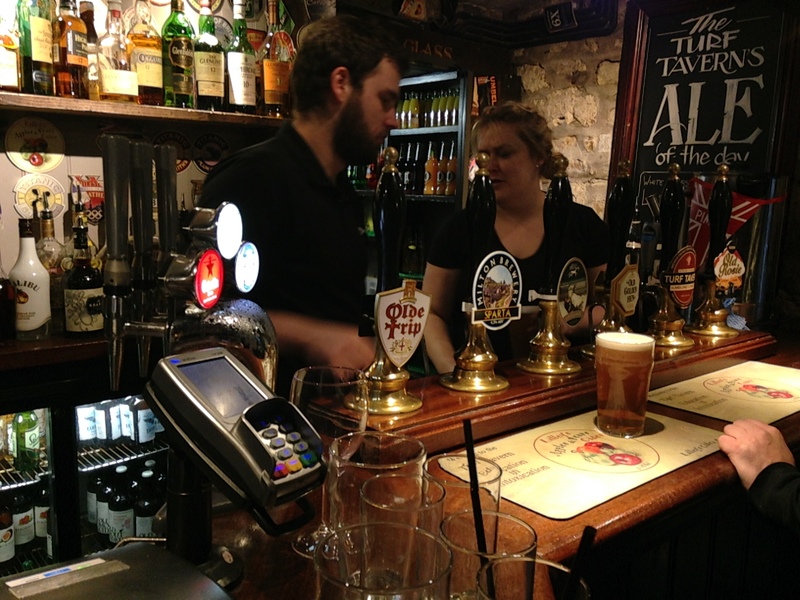 There is a great selection of beers and ales on tap, as well as some more unusual things like rum cider. 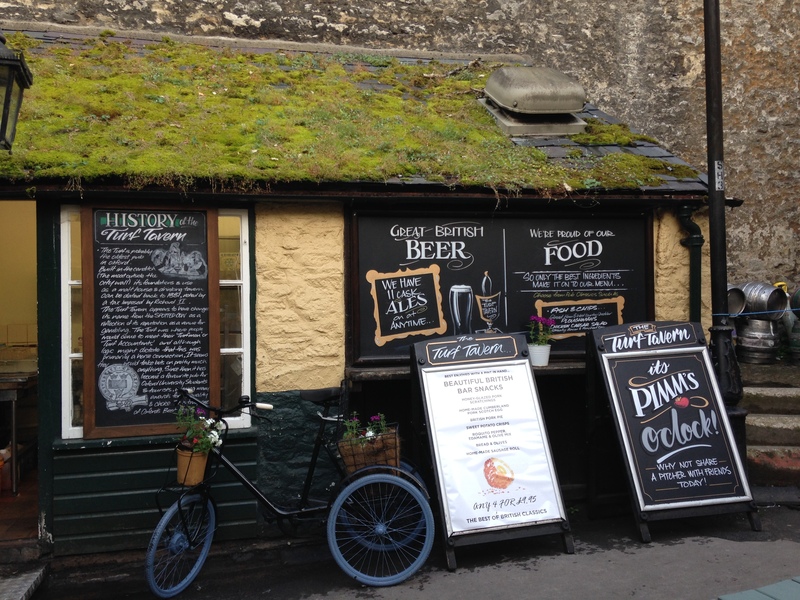 If you’re not into beer you can find all the spirits you could want, as well as wine and cider. All the drinks are reasonably priced and you can expect to go home with plenty of change from your purchases (depending on how much you buy!). 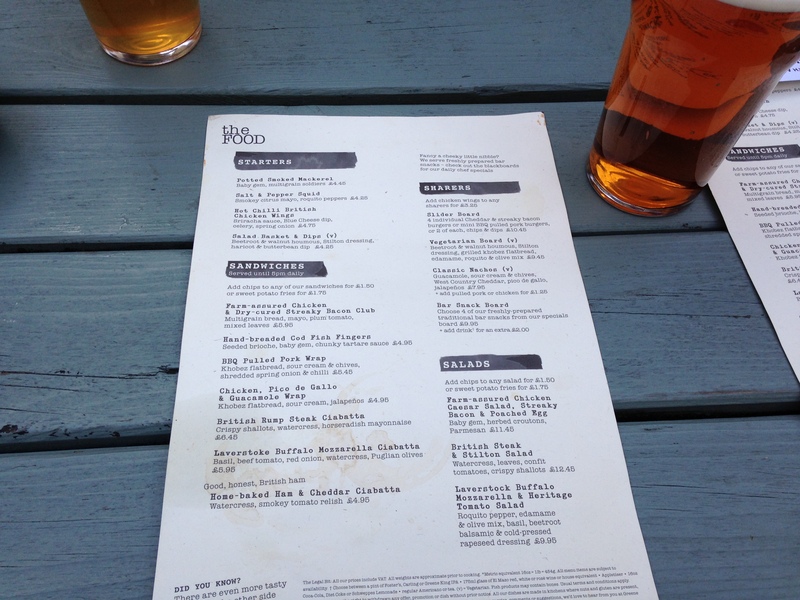 The food is also great – it is a good mix of traditional pub food with a few unexpected extras like salads, sandwiches, healthy sides and chimichurri skewers. 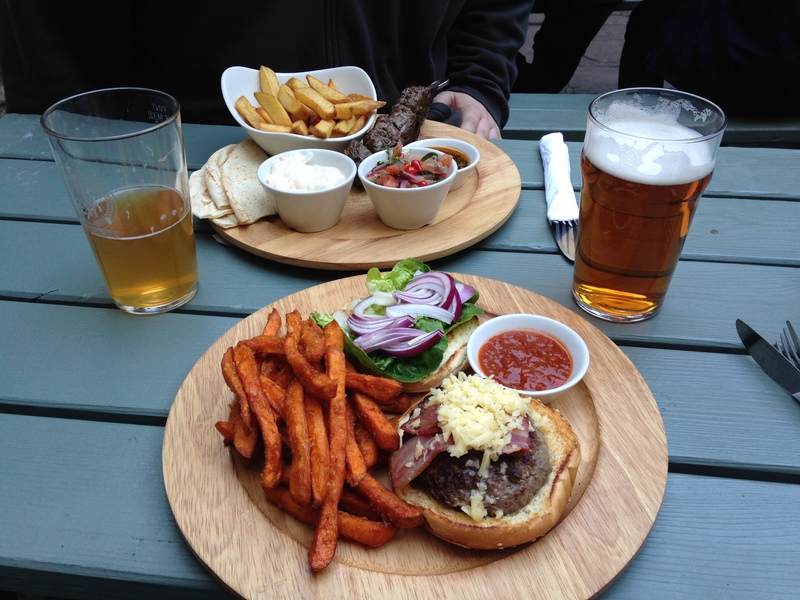 My boyfriend had the beef chimichurri skewers (you can also get chicken ones), and I got the beef burger (which has a variety of toppings, and you can choose the type of cheese it comes with – I opted for cheddar and no tomato) with sweet potato fries, which I love. The ordinary potato chips are excellent too and manage to be soft and crispy at the same time. Suffice to say we were very pleased with our food! The meat was excellent quality and everything was cooked perfectly. We drank Captain Lilley’s rum cider and Shipwreck beer, both of which we loved. Our food arrived pretty quickly, which was great, and there was plenty of it – though not so much that we felt over-stuffed. As you can see from the menu there are also starters and sharing plates, as well as desserts (simple and delicious, like a brownie and ice cream). I’ve been to The Turf a handful of times and I’ve always loved it. I love that it’s so old and full of history, and the Medieval architecture, as well as the fact that it attracts such a variety of people. Students, academics, tourists, business people, families (it’s very child-friendly) and people of all ages. The food and drinks are great and there’s definitely something for all tastes. 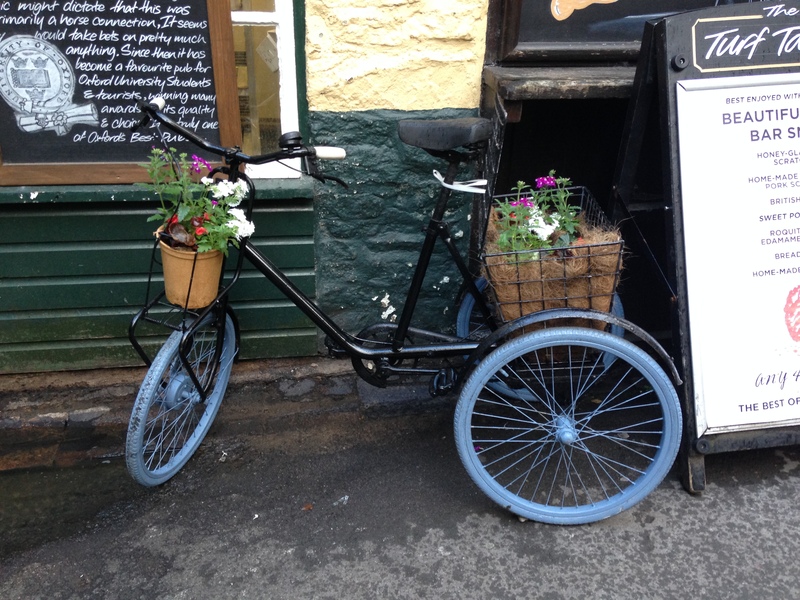 The staff are very friendly and efficient, and there’s always a good atmosphere. The small size of the inner rooms means you will have to wait a minute or two at the bar, and it’s best to arrive early to get a seat inside. 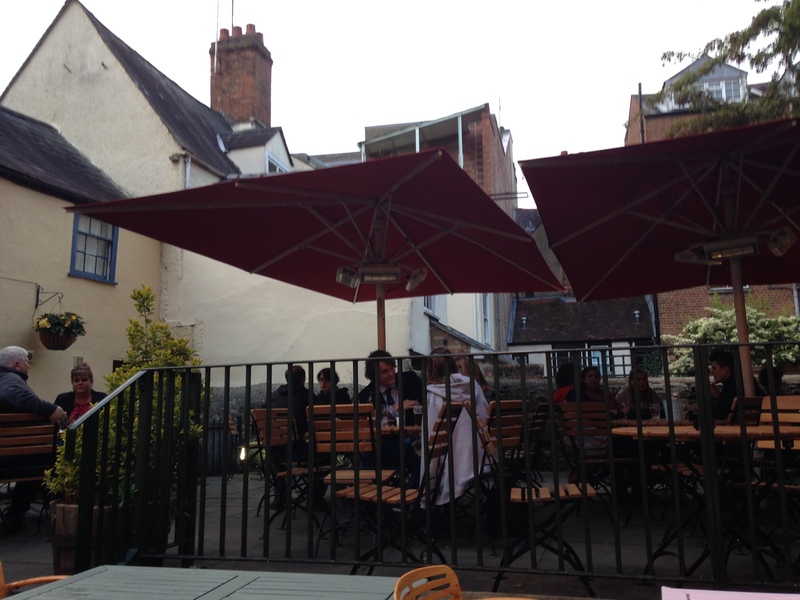 But with the warmer weather it’s lovely to sit outside, and two of the three outside areas have heaters. 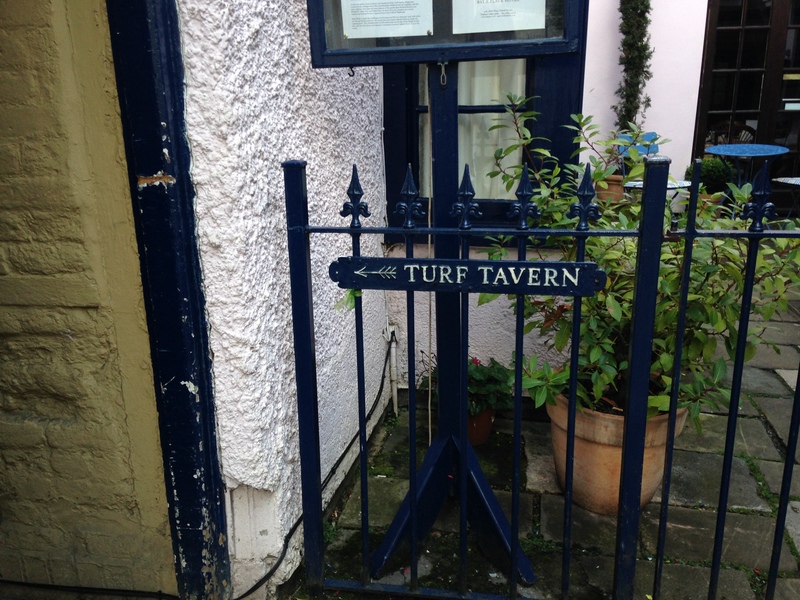 I love The Turf – a good old fashioned pub that’s perfect for everyone.